Save $20 with this Black Friday rebate through 12/03/18. Limit $100 of savings (5 BLACK PACK products) per address. People who love shooting know that your typical box of 50 rounds is only enough for a brisk warm up. But when you really want to get into the flow of things, when you really want your pistol to feel like an extension of your body, you have to fire hundreds of rounds. 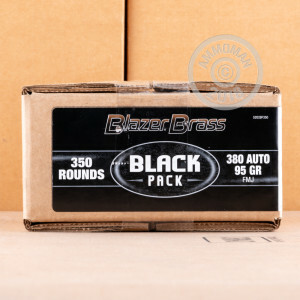 That’s easy to do thanks to Blazer’s Black pack, just a big, beefy carton filled with 350 of the cartridges you need to achieve pure and unadulterated shooting bliss. Don’t forget that we ship all orders of $99 and more for free -- pick up practically any other item from our site while you’re buying this box o’ ammo and we’ll send the whole thing to you free of charge! 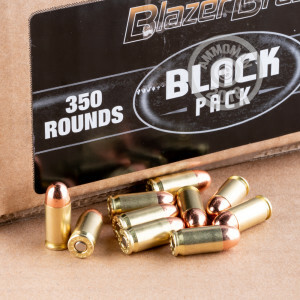 This 380 ACP cartridge features a brass casing, which is perfect for handloading as well as use at ranges which ban Blazer’s more well-known aluminum casings. (Ranges that like selling spent brass often forbid aluminum contaminants.) The round’s 95 grain bullet is a common weight for its caliber and features a full metal jacket, so it will penetrate targets well and spare your pistol’s bore from rapid lead fouling.